If you are a home or business owner in the North Hollywood area, have you ever considered having your sewer line inspected? Probably not, but you are at risk of suffering a lot of problems if you aren’t prepared. Sewer lines in most of the San Fernando Valley are several decades old. As the pipes age, they are prone to cracks, which leads to sewage leaking into the ground. 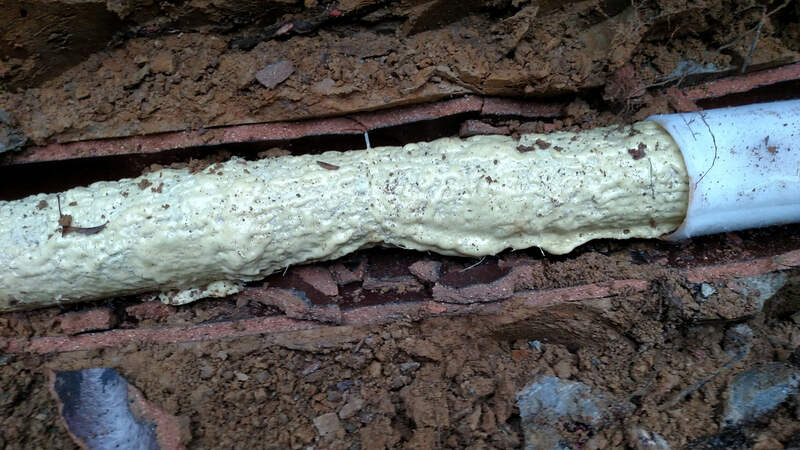 Water leaking from sewer pipes can also make the ground surface unstable. This is what happened to the sewer line at Studio City recently. A pipe that was over 90 years old broke, saturating the soil with sewage until the pavement caved in. The result? A 20 feet deep sinkhole swallowed two cars. Also, as the soil surrounding those pipes gets wet, any nearby tree roots will be attracted to it, and once they reach the sewer line they can easily penetrate it and grow inside, creating a dense mat that stops the water flow and clogs up the pipe. When sewer lines get clogged up by tree roots you can have trouble draining the water from your sinks or showers, and even flushing the toilet will be an issue. Eventually, sewage can back into the house, flooding basements and creating a lot of damage. Many sewer problems go unnoticed for some time, slowly growing until a catastrophic failure occurs. If these issues are detected and fixed in their initial stages, further problems can be avoided. That is why a regular sewer video inspection in North Hollywood should be done. Even if your home’s plumbing seems to work fine, an inspection will verify the pipe’s condition and let you take quick action if there is anything wrong. The video inspection process is very simple. We use a small camera that is attached to a flexible cable. This camera is inserted into the sewer line, and as is moves along the pipes is sends a live feed to an external monitor. It also shows its exact location, so as problems like cracks or broken pieces are found, we can take note of where they are located, eliminating any guesswork. Video cameras are one of the most important tools in a plumber’s arsenal. Knowing the exact condition of a sewer line can let us verify that the line can be repaired instead of having to replace it, which will save you a lot of money. And since they can move through the pipes that are buried underneath your garden and driveways, there is no more need to dig to inspect the pipes anymore. Everything can be done remotely. Once the problem has been fixed, a final video inspection can assure you that the line has been properly fixed and the problem solved. Video inspections are also recommended if you are planning to buy a house. Don’t take the word of the seller, get the sewer line inspected, so you are sure that it is in good condition and won’t be a problem you will have to deal with later on. For any commercial, industrial, or residential plumbing needs, Rapid Plumbing is ready to help. Give us a call and schedule an appointment with our highly-skilled staff. Over 20 years of experience are at your service.